Hi everyone! It’s Lisa with you on this very special day…Veteran’s Day (here in the U.S.) and I’m especially proud to be posting on behalf of the Design Team as I AM a Veteran. Today means a great deal to myself and my family as we all served in the military (the United States Air Force) and swore to protect and serve this beautiful nation that we live in. So, I’m thrilled that I’m able to share a card that I made to celebrate this day. I used the amazing 3D Foam Stars with Foil from the 3D Foam Holiday Embellishment Kit to create the focal stars. It’s so simple to do! I then adhered the stars to an embossed piece of cardstock which I had already trimmed to size. 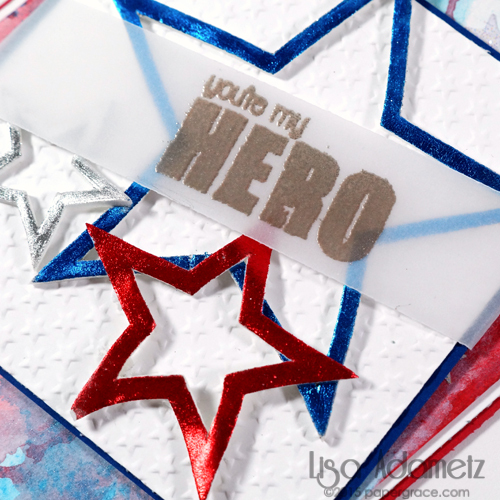 I stamped the sentiment in an embossing ink and heat set with a silver embossing powder onto a piece of cardstock weight vellum which I wrapped in a banner style around the piece with the foiled stars. This was adhered in place using Thin 3D Foam Squares – Mix, White. I then created a background using Gelatos® by scribbling them onto my work surface, spritzing with water, and then “smooshing” my paper directly into the wet Gelatos®. I dried the paper in between until I achieved the look I desired. 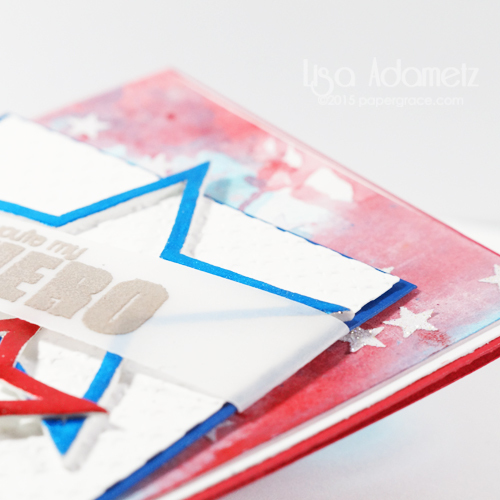 On top of this background I added stars and sprinkled glitter on top to adhere to to adhere to the stars. All the panels were adhered using plenty of E-Z Dots® Permanent Refillable Adhesive. Thank you so much for joining me on this Veteran’s Day. This entry was posted in 3D Foam Shapes, 3D Foam Squares, Adhesives, Cards, Crafts & Tutorials, E-Z Runner® Dispensers and tagged 3D Foam Holiday Embellishment Kit with Foil, 3D Foam Stars, 4th of July, Bazzill Basics Paper, Card, Craft Foil, E-Z Dots Permanent Refill, E-Z Dots Permanent Refillable, E-Z Runner Grand Permanent Dots Refill, E-Z Stars Refillable, Faber-Castell Design Memory Craft, Fun Stampers Journey, HH Double-Sided Tape Runner Refill Dots Permanent, IMAGINE Crafts/Tsukineko, Lifestyle Crafts, Lisa Adametz, My Favorite Things, Neenah, Patriotic, Ranger Ink, Stars, Thin 3D Foam Squares White. Bookmark the permalink.